In the George Foreman GRP1060B review I found that it is the number one seller in contact grills in many stores. When I look at the average number of buyers that took the time to share their experience and opinion about this indoor electric grill I can only come to the conclusion. This George Foreman grill deserves the rating they gave it. You can read here why I came to that conclusion and see if this is the George Foreman indoor grill you need. I looked at a large number of sites including online stores, forums and the manufacturer site to find all the information I needed to inform you about all the features, pros and cons and our overall opinion about this contact grill. The grill surface and the grill temperature are in my opinion the most important feature I like to know. This 4 serving George Foreman comes with a 60 Square inch grill surface and this fits about 4 regular sizes burgers at the same time or two grilled cheese sandwiches or 4 pieces of chicken. The actual measurements of the plates are 9.5 x 7 inches. The grill surface is made of non-stick aluminum and are removable for easy cleaning. The temperature is just one setting and I read that it gets pretty hot. Makes nice grill marks on the meat. There is no on/off switch to worry about. Cleaning is very easy with the removable grill plates. They are dishwasher safe although many site recommend to not put the non-stick plates in the dishwasher because the dish detergent and the force of the water can damage the surface. I have read both sides of the stories and to be hones more people use the dishwasher without any problems. See our recommended sponges at the bottom of this review. Nonstick removable plates are mentioned as working great and very easy to clean even in the dishwasher. I just have to mention again that some consumer sites warn not to use the dishwasher for nonstick surface because the detergent in combination with the force of the water can damage the surface and that is not healthy. The top plate is a little loose and that is done to make it slide a little when you close the top lid. It makes the contact surface of the top plate fit your meat or sandwich better. Fast heat up feature that was mentioned as a plus is something I could not find back in any of the other reviews I read. It is however an 1150 Watt grill with a 60 square inches grill surface and that it is a lot of Wattage for such a “small” size grill. Temperature indicator light comes on when the grill is plugged in and when it is hot. Just give it time to heat up so you can enjoy the grill marks. Sloped design is for a better removal of the grease or oil dripping and keep it away from the meat or sandwich you are grilling. Less fat is better for your health they say. The adjustable hinges go up to 1 inch and do not press too much, but just the right amount of pressure. I read people using to cook 2 inch thick steaks but then you have to move it around because the hinges want touch the steak on the whole surface. Other people mentioned that it was not problem and the just flipped it over one time and the steak came out great. Since it works great for grilled cheese and other sandwiches the question of this is a good Panini maker is answered with a yes. This indoor electric grill had one temperature setting and no adjustment. I could not find anyone complaining about missing a temperature control button. There is no on/off switch on this grill and all you do is plug it in and it starts working. The length of the cord is a little under two feet and the cord is attached to the left back side of the grill. With an almost 2 feet long cord it should not be a problem to put it on any place you want it and is easy for you. The height when fully opened is 13” and that is something a lot of people liked to know since sometimes this limit the use with low hanging kitchen cabinets. We all like to see nice grill marks on our meat and that is no problem with this grill since it gets hot enough for that. Us it right away to avoid warranty issues is the best warning I can give. Sometimes people wait until the return policy date has passed and then find a reason to return it but cannot do that anymore. If it is a gift advice to use it fast for the same reason. I have not seen many returns for the George Foreman GRP1060B but this is more a general warning for any purchase you do. Besides the occasional lemon that it did not work I could not find too many complaints besides the burning plastic smell when used for the first time. The rating I found are a little bit lower than I would give it but are still pretty good. Compared to many other indoor electric grills I consider this indoor electric contact grill fairly cheap priced. All the good ratings taken in consideration this grill is a pretty good buy and recommended for a 1 or two person household. Or for more if you only use it for burgers or smaller cuts of meat. After doing the George Foreman GRP1060B review I found that more than 70% of customers who bought this George Foreman Electric Grill and Panini Press have given it a five star rating online. This is a small percentage of customers on just one site; imagine how many other customers on how many other shopping sites this grill has made happy. This electric grill and Panini press is the way to go for delicious and quick meals, just the way you like. It has lightweight plates that are very easy to remove and insert, making clean up easy. Moreover, the plates are dishwasher safe. How amazing is that! Burgers and meats leave a lot of fat and oil on the cooking surface, which becomes very easy to clean, thanks to the detachable grill plates. What makes clean up even easier is the non-stick plates. Moreover, they also completely eliminate the need for oil or butter to keep food from sticking to the surface. This gives you beautiful looking food that does not have any smears or tears at all. This is a contact grill, which means it has two plates to press your food on both sides, so there is no need for flipping. This mechanism takes less time, and cooks your food evenly. Most appliances are complicated, but not the GF grill and Panini press. It is very easy to set up, and use. It comes with an instruction manual, so you should be able to get a hang of it within minutes. It has got almost a 9 by 7 inches cooking surface, which is ideal for a couple or small family. Although the product claims to prepare enough for serving four, many customers feel that that’s not the case. The grill is big enough to hold just two burgers; however, if you talk of sliders, then yes, you can definitely make four. But this is not something awful, unless you are considering throwing a party for your friends and family. It’s the right size for a single household. And it’s especially a wonderful piece of equipment for young people who are always on the run. This grill takes around 3-5 minutes to heat up, but once it’s hot, it cooks up your food nice and quick. The cord is short for safety purpose, so that it does not get tangled anywhere. The grill is switched on and off by plugging it in and out; this is something that can definitely be improved. An on/off button will be much more efficient, I believe. Another thing that can certainly be improved is temperature control. There is no way of knowing what temperature the grill is cooking at, and this can be quite a problem for amateurs. The grill has got indicator light, which is red during heat-up, and green when it is ready for cooking. This is a pretty nice feature, especially for beginners. It also comes with a drip tray to catch fat and grease, so as to present you with healthy food. Grilling has a magic that adds flavor to even the simplest food. Just switch it on, get your favorite veggies from the fridge, place them on the grill, and have a delicious meal ready in minutes. You can cook both defrosted and frozen burger patties on this grill. However, I would recommend cooking medium sized steaks on the grill, if you want them well-done. Otherwise, you can use thicker steaks. The grill is light enough to place on your countertop. I’d say that you can even carry it when traveling. All in all, it’s a great piece to equip your kitchen with. 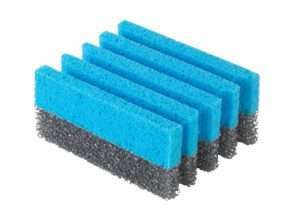 For easy cleaning these sponges come in very handy and do a great job. Many users recommend them. Click here to see the price! Cleaning your grill is very important to keep it in a good shape and to help you keep grilling healthy meals on your George Foreman grill. You can find more George Foreman grill reviews in the menu. 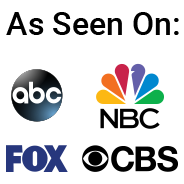 I am reviewing many other models and compare them to their competitors to help you find the perfect indoor grill for you and grill some healthy food!